Summertime calls for freshly painted nails to match summer dresses, swimwear, and even wedged heels. And, while it might be hard to keep hands and cuticles moistened—coarse sand and chlorine are not our friends—a bright, summertime polish can keep your nails looking sharp and sleek. Here, we have a few standout hues from the DAZZLE DRY brand, the line of choice at Spa@theWit. An added bonus? All these polishes dry rock-solid within 5 minutes and are chip-free, lasting about 4 weeks. What’s more, it’s non-toxic, vegan, and removes like regular polish (great for those in need of a quick treatment). 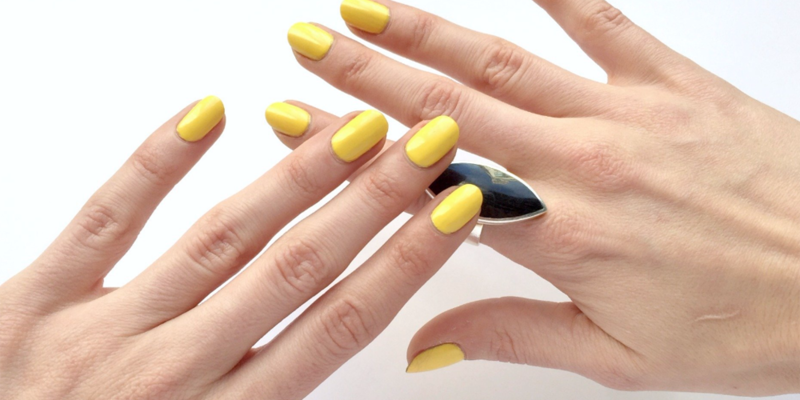 Sun’s out, yellow nails out—there’s no better color to highlight summertime’s brightness than a cheerful yellow. And, yellow adds a pop of color to any outfit, complementing every hue imaginable. If you’re looking for something bold, Sahara is a terrific option. For something a bit lighter with a hint of crème, go for Linen Lace, and for a fun, neon finish, try Frozen Lemonade (perfect for summertime music festivals, too.). Purple can really make statement, but in summertime, it’s better to go lighter than darker or to go for a neon shine. If you’re looking for a bright, neon polish, DAZZLE DRY’s Grape Lollipop is fun and full of personality. If you’re going for a lighter, pastel look, Week in Provence is your best bet, as it comes off as a lilac-gray. And for some glitter glam? Amethyst gives some sparkle. Light blue makes you think of the water, and there’s tons of time spent on the waves during summertime. Plus, blue can be relaxing, so it’s a great hue to look at when you’re feeling stressed out. A few options: Morning Sky, Aegean Cruise (with an added shimmer effect), and Lotion Please, the latter resembling a baby blue. Off-white colors radiate sophistication, and these lighter, classic colors can also pair with any outfit or style. Offering an airy quality, these types of colors seem ethereal for summertime and help nails look clean and polished. For a whiter underlay, Misty Moon is a good option, for a slight pinkish tone, Alluring Charm, and for a milky, thicker coating, Starry Eyed. Save dark green for winter. Going with lighter hues or olive tones is the way to go in making a summertime statement on your fingertips. Olive has a good balance between dark and light, and it’s a great seasonal color. From DAZZLE DRY, Waltz With Me is a clear winner. For earthiness, Morning Dew is a good choice, as it resembles a wheat grass color.